With Easter and Passover this week, some of you may be hosting people for brunch or supper. That reminds me of a query that my friend Claudine sent me a little while ago, that I am finally getting around to answering. Send your own burning questions to acharmedwife@gmail.com and I will do my best to relieve the burning (it just might take me a little while). Although I'm sure that the dinner party in question has come and gone, hopefully this information will be useful for future fêtes. There are lots of creative ways to set a pretty table using things you have around the house- proper placemats and tablecloths not required. I suggest you table your preconceived notions of place setting for the duration of this post. If you are worried that it will look too bare or sloppy, take special care with the centerpiece and place settings (a special napkin-fold goes a long way). You can make pretty and inexpensive centerpieces using a cluster or trail of small jars or vases holding individual leaves, branches, fronds or blooms. Or put small bowls of fruits on instead (as a bonus, if your dinner doesn't turn out, your guests will still have something to eat). If you have your heart set on putting some kind of covering on the table, you have a lot of options. 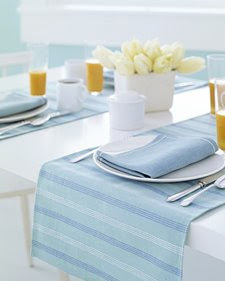 Any napkin can be used as an impromptu placemat- play around with it- depending on the dimensions you may want to place it at an angle or have some of it hanging off the edge of the table. Feel free to mix and match, if you need to. And three or four placemats end to end can create the look of an attractive table runner. 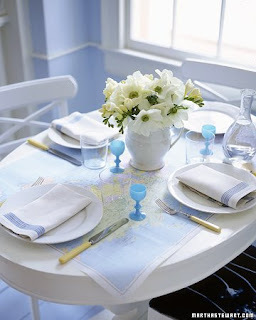 Or get creative with other things around the house- a map makes a charming table covering (as in the photo at top), or a long strip of wrapping paper or cloth from an old bedsheet can be used as a runner. In other words, take what you've got and runner with it. If you have a little more time, and access to a fabric store, you can make a no-sew tablecloth, set of placemats or runner from inexpensive cloth, by ironing the seams shut with stitch witchery. Cheap muslin, patterned cotton or even burlap can make for something attractive and unusual. While there are no rules for how you choose to cover the table (or not), I'm an absolute stickler for the rules of placing the china, glassware and utensils. People have been setting tables this way for hundreds of years, and there's a good reason for the placement of each component- maybe you are creative and smart enough to improve upon it, but I generally try to stick with a classic. 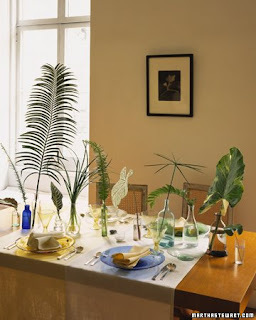 photo credits: all photos from Martha Stewart, place setting diagram from Emily Post. If you closely at the Martha Stewart pictures, she actually does have something under the plates. I would highly recommend using placemats or a tablecloth to protect your table. Moisture or heat can ruin your table and fixing that mistake costs a lot more than table coverings! You can find cheap, but chic, options at flea markets, ebay, etc. Mismatched, vintage linens can be lovely. Like Lily said, you can also use pretty napkins.